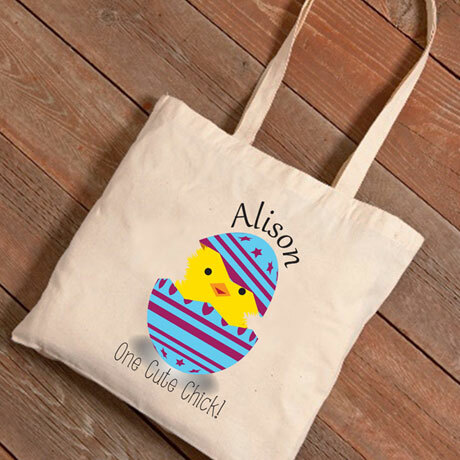 Kids will love having their name on this handy tote, it's the perfect Easter gift or Easter Basket alternative. Roomy enough for the most successful egg hunt it measures 14 1/2" L x 14" H x 1" W with 26" shoulder straps. 100% cotton canvas. Machine wash. Specify name, up to 12 characters. One Cute Chick will appear as shown. Order by March 15th for delivery by Easter. No rush delivery or gift box. Please allow 2-3 weeks for delivery. Item can only be shipped within the Continental US.